Best Hurdle Weekend EVER? Masai Russell MD #2 All-Time At VA Showcase! It was a weekend that will long be remembered in Maryland state track and field history. And perhaps no event saw more consistent, across-the-board dominance than the 55 meter hurdles. It began on Thursday night at the PG County Championships. Henry A. Wise's Daniel Whitfield set a new MD #1 mark in the event at 7.34 seconds - the fourth-fastest mark at the time on MileSplit MD's all-time leaderboard, dating back to 2000. The performances only increased from then on out. 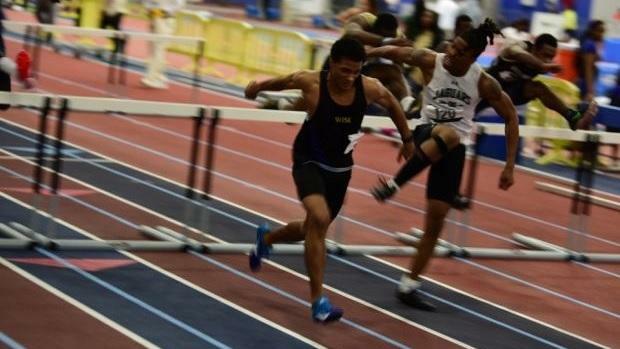 In the 55 meter hurdle prelims at the VA Showcase on Friday evening. Bishop McNamara's Taylor Grimes became the first Maryland girl since 2013 to break the eight second barrier in the event. Bullis' Leah Phillips and Masai Russell weren't too far behind, either, both clocking in at 8.02 seconds. Meanwhile, back in Maryland, South Hagerstown's Andre Turay saw Whitfield's 7.34 and raised him one hundredth of a second at the Washington County Championships. Only Dondre Echols (7.17 in 2012), William Henderson (7.24 last season) and Shyheim Wright (7.27 in 2015) have booked faster performances in MileSplit MD's database. 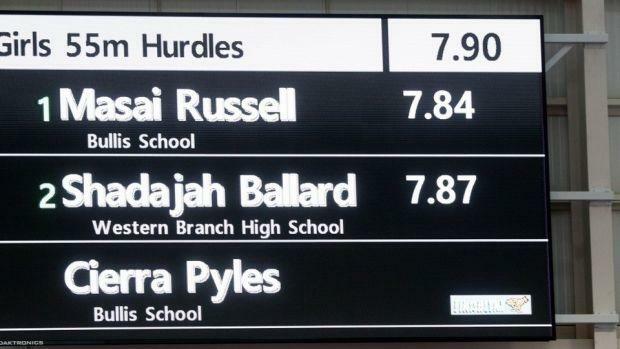 The grand finale came on Saturday, however, as Masai Russell topped them all with a winning 7.84 performance in the 55 meter hurdle finals - a new Maryland state record. Grimes was not far behind, finishing in third place at 7.89 seconds. How long will Russell's record hold up? Can Grimes, or perhaps Russell's teammate Leah Phillips (who entered the weekend with the MD #1 time in the event) take the record for themselves? And will either Whitfield or Turay top their performances from earlier this weekend in a race for the top time in the state? Either way, the rest of this indoor season features many questions to be answered (and possibly, more all-time state records to be broken).